Bearing in mind as I do, that cute pictures of pets are difficult to go wrong with (and guinea pigs seem to score well on the cuteness front 🙂 ), let’s welcome the smallest members of the Walker family to the proceedings. I should start by pointing out that Sunny (the light brown one) is actually larger—and a few weeks older—than his adopted “brother” Harry (the “tricolour” one), but the photo here makes Harry look bigger just because he’s nearer the camera. As you figured out, they are both males, and our first pets. 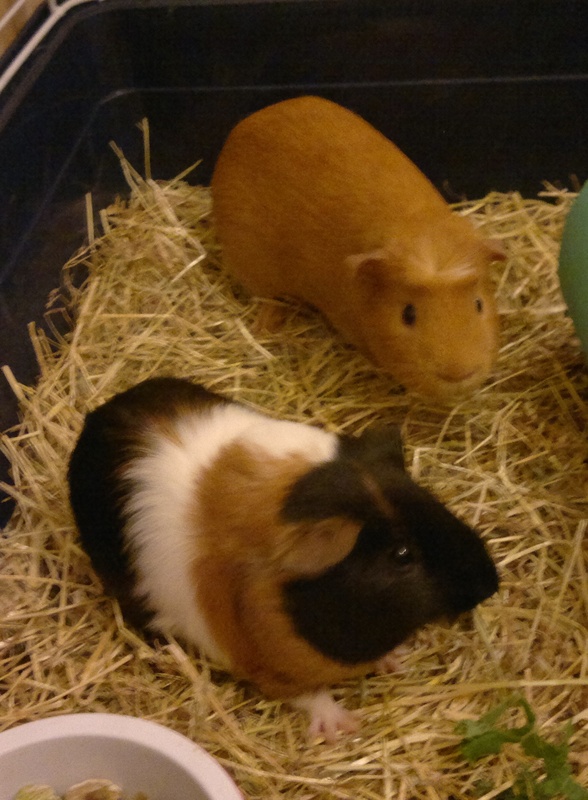 We chose them because our research seemed to indicate guinea pigs make good “first pets”, and so far our limited experience seems to bear this out. We are still learning how to take care of them, and are pretty sure we have more to learn, but we’re enjoying the “journey” so far! We are already seeing that Sunny and Harry (who, by the way, were both named by our daughter Naomi (6)) have quite different characters. In general, Sunny is the less outgoing of the two—he’s often the more “skittish”, and more likely to run around if you try to pick him up (though he usually relents in the end). Sunny likes his food; he’s usually the first to start “wheeking” when you rustle a plastic vegetable bag in earshot (meaning he expects his “nosh” any time), and occasionally chatters his teeth in mild frustration if we take our time dishing out. He likes a stroke and cuddle, though he sometimes gets bored and looks for somewhere else to explore; most of all, like Harry, he appreciates having people in the room with him, and shows his appreciation by mock-chasing his cage-mate (and the noises they make, I gather, mean they’re having fun!). Harry is quite a different character—I think of him as the “mischievous little brother” to Sunny. He seems to be more outgoing and obviously happy than Sunny, and is also the more likely of the two to start “popcorning” (i.e. doing little hops; apparently, a guinea pig’s way of showing they’re particularly pleased), though they both do it sometimes. Harry is very attached to Sunny, and if we take Sunny away for some reason, Harry starts “wheeking” loudly, as if to say “please don’t leave me alone here”. Although they both like attention, Harry seems especially fond of a good stroke, and is always the first of the pair to make the high “purring” sound guinea pigs come out with when they’re comfortable with attention. Although we try and give Sunny and Harry exercise and playtime outside their cage whenever possible, we feel we’d like to provide a larger, more secure “playpen” than they currently have, so we’re looking around for inspiration, for a way to give them this kind of space without “breaking the bank”. We’re also getting used to the idea of having pets in the first place, but I think we’re already very attached to these two little fellows, and look forward to learning more about them as we all get to know each other.